One of Italy’s greatest assets is its unspoilt countryside. Especially for those living urban lives elsewhere, rural Italy seems a kind of earthly paradise, and it is no surprise that country homes are among the most popular property types sought by foreign buyers. Italian countryside is genuinely special. Much of it consists of gentle rolling hillscapes with backdrops of distant mountains. The green and fertile land is enlivened by swathes of wildflowers in spring, by sun-blonded grasses in summer and by burnished leaves in autumn. Most appealingly, because Italy is not a nation in which most people live in big cities, its countryside is liberally sprinkled with charming old villages and tiny towns. These appear at pleasingly intervals on the landscape, their pretty rooftops and belltowers adding extra decoration to wide rural vistas. Inside, these friendly villages have warm communities, useful shops and entertaining festivals. Thus when you buy a home in the Italian countryside, you are not completely cut off from civilisation. You have all the space and quiet you could wish for, but also useful facilities, services and oppurtunities to enjoy the social life never too far away. Rural Italian properties tend to be much cheaper than homes situated in a city or right on the coast. 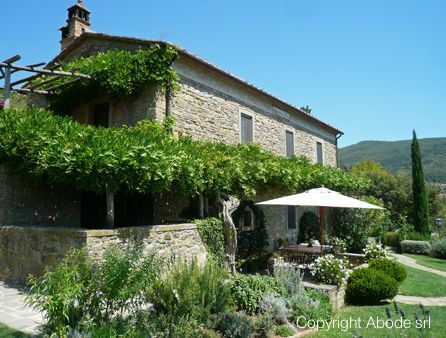 There are exceptions to this, the chief example being beautiful central Tuscany, where you’d be very lucky to find a farmhouse for less than €500,000. The similarly lovely countryside of Umbria or Le Marche usually presents rather better value for money. Naturally, www.abode.it features plenty of interesting properties in all these places. And remember, in almost all of Italy’s regions, the further inland you go, the lower the property prices. Buy somewhere within ten miles of the sea and you can make good savings AND still have easy access to the delights of the coast! Before you begin your property search, it’s very useful to decide whether you want to buy a tumbledown old building needing restoration work, a newly-built property (you can choose one built in a traditional style if you wish), or an older home that someone else has already lovingly restored. The advantages of restoring yourself are that you can impose exactly your own taste on the fabric of the building, and, in many cases, end up with a house whose ultimate monetary value is more than what you paid for the original plus the building work. The disadvantages, of course, are the large amounts of time and organising which restoration projects can sometimes take! Simply, if you crave a home in the Italian countryside, there are many ways to do it. Think hard about exactly what you want, then go for it! A Buyers Guide to Rural Property. Too often, people who have purchased land in the past will think that they can just purchase rural land and that all things will remain the same.